With such a great role model, the Egerländer brass band combines this formation and the ambition to create a soft sound in all registers according to exact, collectively executed phrasing and also the use of the chosen composition and exquisite arrangements. The objective is to achieve a polished style and an appealing, pristine sound. 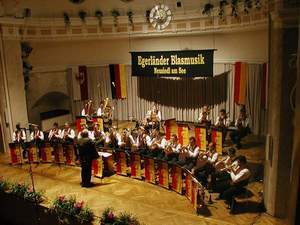 The typical sound of the Egerländer band is achieved by doubling the number of flugel and tenor horns. A small instrumentation, often favored a result of cost cutting, would never be able to achieve this sound without an amplifier. The Egerländer Brass Band, however, never performs with such amplifiers so that the results are unaltered. The ambiant of a concert, the growing interest of the audience and the tone in the concert halls are of utmost importance during performances. You can decide whether the Egerländers have been successful or not in their attempt to provoke enthusiasm in the concert experience during the last years CD, Video und DVD by either watching recordings or clips of the performances. In the recordings from the past years you will find many of the well known Bohemian melodies that have accompanied the Egerländer success over the years. These are additionally supplemented by small jaunts into other music styles.